I won’t go into a long winded explanation of ‘why’ you should have a blog, or many blogs, if you are a person with many fields of interest and or a business owner, so I will provide a few links to some good reasons but you can find many more yourself. I blog for a few reasons; get my ideas on paper(albeit digital paper), share news and ideas with others and probably the primary reason is that it allows me to put information into a place that then allows ME to easily find that information I know I have ‘somewhere’ into an easily ‘searchable’ format. I often go back to my own blogs to find technical information on how to do things I know I have done in the past but can’t remember exactly how to now. By putting this information online I can easily find that information. A recent example was trying to help someone share an external Mac Volume. I couldn’t remember the terminal syntax. But I know I’ve done it many times before in the past. So I just searched my blog for ‘external Mac volumes’ and found what I was looking for! For business owners, special interest groups and artists blogs can be an invaluable method for connecting with the public! Of course you can do this: http://tinyurl.com/2vs5trg and find many more. So let’s get started. Virtually all blogging services offer a simple ‘new post’ option to add new entries. It’s as simple as logging into your Blogger, LiveJournal, WordPress or other account, going to the ‘dashboard’ and choosing ‘new post’. Simple and easy but not that customizable or feature packed. For many people this is usually more than enough to get started. But once you decide you really want to continue your writing you should look at some other ‘publishing’ tools. My favorite tool for creating posts/blog entries – Windows Live Writer. Live Writer makes it easy to share your photos and videos on almost any blog service—Windows Live, WordPress, Blogger, LiveJournal, TypePad, and many more. Live Writer lets me truly create the post I am looking for. It also allows me to create ‘drafts’ that I can work on as time permits and review them before publishing. The following videos directly from the Live Writer Team are excellent and way better than anything I could have done by just doing screen captures and writing explanations. They are short and very instructional and well worth bookmarking and watching several times. Note that if you use Google’s Blogger blog service or WordPress (or even host your own) blog you do NOT have to set up a Windows Live blog. Make sure to click on ‘ I already have a weblog set up’ and go from there. Live Writer is VERY much like MS Word in it’s formatting options. This makes it very easy to get the look and feel you are shooting for much easier than trying to do this via the ‘dashboard’ of your blog account. How to insert images, video and other content into your post. If you really want your blog to be ‘found’ by people searching and actually read you should make a concerted effort to create appropriate ‘categories’ or ‘tags’ for you posts. Just like you organize your hard copy files in a file cabinet, you can organize blog posts into categories or with tags, so they’re easy to find by people using search engines (Google, Bing, Yahoo etc.) and by people searching your blog site in the future. Tags are often listed on blogs ‘sidebar’. In order for your blog’s categories to be helpful to your readers, they need to be fairly intuitive, meaning it’s obvious what kinds of posts are included in each category. As you create your categories, think like your readers would. It’s also important to strike a balance between creating categories that are too broad and therefore don’t help readers narrow their searches and those that are too specific and offer so many choices that readers are confused. I could go on and on but I just wanted to get this out there for those that were looking for some good directions to start. For now LiveWriter is still only a Windows application – Sorry Mac enthusiasts. But you can run it from a Virtual Machine ‘inside’ OS X. Or use the Firefox plug-in ‘ScibeFire Blog Editor’ for LiveWriter ‘like’ functionality. But I’ll save that for another post. I had this issue previously and it appeared resolved. But it has returned after upgrading my WordPress installation to 3.x. So I tried the simple thing of just disabling all my plug-ins but that didn’t do it this time. I had to do that (disable my plug-ins as described here) and all this too! I hope this helps some of you. Please make sure you have a complete backup of our MYSQL dbase AND your blog in case you hose something! I am a nut about backups and you should be too. 1. Using either FTP or CPanel, navigate to your WordPress root directory. 2. 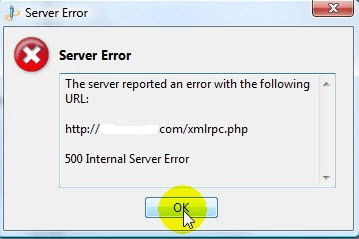 You should find the file “xmlrpc.php” there. Make a back up copy of it, just in case. Download it and then. 4. Go to the end of the file. 6. Delete anything there, including spaces, or blank lines. 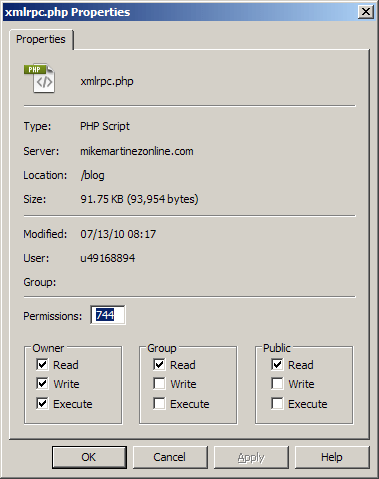 This file has to be placed into the root directory OR /wp-admin/ within your WordPress installation. Also if you are creating the file locally and then uploading it make sure you change the file to a .ini and it does not still have the .txt extension on it. So after a few hours of aggravation I can now publish posts with loads of content from Window Live Writer again! UPDATE: This guy here has a new solution for 1&1 users that works well! This problem cropped up and recently and really got me pissed. I absolutely LOVE Windows Live Writer. If you post often to sites or blogs this is probably the best tool I’ve found for easy posting, short of a full fledged website/content management application or system [Dreamweaver, SharePoint or the like]. I will post much more in the future on all you can do with this application or you can just ‘Google’ your time away and look for tips. I messed with php files, ini’s, mysql tables, and on and on. Well dang if that didn’t work!! I then just re-activated my plug-ins and all was good. Maybe some of you might use this info one day.